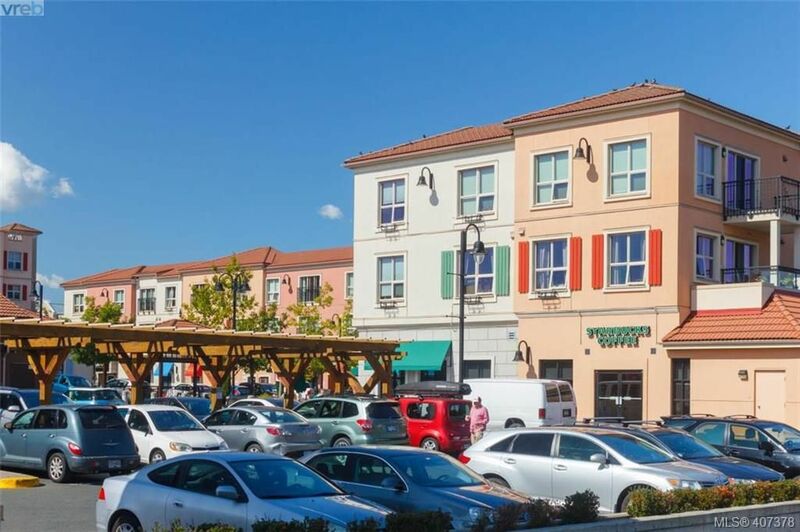 Tuscany Village an Italian inspired plaza style living and shopping center with all of your grocery / shopping and dining needs right at your doorstep. Well appointed 2 bedroom 2 bathroom condo in excellent condition and ready to move into. South facing, warm with great light...and spacious open floor plan with 9' ceilings. Quality finishing with cherry hardwood flooring, granite countertops and custom fit Hunter Douglas blinds in the master bedroom. Very nice split floor plan spacing the two bedrooms apart from each other. Comes with all appliances including dishwasher, fridge (water / ice maker) stove / oven, microwave. Pets and rentals allowed, in-suite laundry included, secured parking (1 spot with suite) and additional storage round out the many features of this property. Very close to the University of Victoria and on all the major bus routes for quick access to Downtown, Uptown shopping centre and all points in between. The Dimore - Tuscany Village shopping center Starbucks side.